I had found this lampshade at Lowe's after Christmas for$ 3.75 and it is approximately a 12 inch shade. It originally came with a red and white plaid trim at the top and bottom, and that was why it was on clearance. It was easy to remove the trim and begin a new project. I purchased this fabric on sale at Joann's a few weeks back. I thought it would look great on the shade. The fabric for 1 yard was $10.00 and I used about half of a yard. 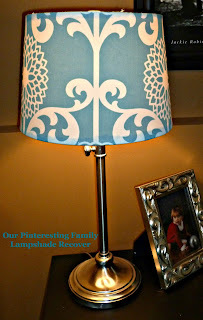 I had pinned a wonderful tutorial by the The Creativity Exchange on how to recover a lampshade a while back. The tutorial is wonderful, and I was able to follow it very easily. The first step was to trace the shape of the shade on the fabric with pencil. We flipped the fabric over and rolled the shade beginning at the seam and back around. Drawing a faint line on the fabric alongside the top first, and then rolling it again drawing a line along the bottom. The top and bottom of the shade were two different sizes. Then I cut out the fabric as you can see below. What I did next was take the end piece and hot glue it along the seam. Then I wrapped the fabric completely around the shade and glued the other end down as well. Then I used hot glue to glue around the top where I left the least amount of extra fabric. It worked out better for me this way. I used clothespins to hold down the areas that I was gluing. Then I cut around the metal pieces of the shade. I then did the same thing on the bottom working my way around and pulling the fabric tight. I was pleased with the final product considering it was my first try, and I hope to find another base at Goodwill or similar store. For this I used my lamp I already have to show you the shade on a lamp. Thanks for stopping by! Hope you had a great holiday weekend. That is a really pretty new fabric! Nicely done! I love this fabric!! So pretty!! Good update. I love the fabric. Looks great! I found you over at DIY Project Parade and I am so glad I did! It caught my eye right away because that is the color of my kitchen and I just happen to have a lampshade I want to redo. Thanks so much! LOVE your lampshade. What a pretty fabric you chose too! This is really cute. I am in the process myself of making a lampshade. This was very helpful, thank you! What a great lampshade! Lovely fabric! I love this and I have 3 shades that I'm so tired of looking at! Your tutorial looks easy to follow and I'm going to give it a try! Thanks for sharing it! Gorgeous shade redo. I love your choice of fabric. I am happy you joined in on the newbie party. I would love if you added my link or BUTTON to the actual post, that is the best way to get the party out to other newbies who may want to join in as well. Thanks. Thank you so much, Tammy. We appreciate you stopping by! I love the Fabric!!! So fresh! Great Re-Do! I recovered my old lampshade a while back and I love yours. I am so impressed that you actually are doing projects that you pin. I need to be better at that. Thank you so much for having us! We appreciate you stopping by. I'm so glad you posted this, as well as the tutorial you referenced! I'll be recovering my lampshades soon, but I had no idea how to begin! Thanks for sharing on Mauvin' Monday! Great lampshade project. The fabric is beautiful. Thank you so very much, Judy! The fabric pattern is perfect for the lampshade, good choice! Thanks for stopping by, Kerry. We appreciate the sweet comment. Thank you so much, Robin. We appreciate you stopping by and commenting. This is absolutely amazing! I love how it turned out. What an awesome addition to the room! Found you over at Tip Me Tuesday. Love this lamp shade! The fabric is so pretty, and it happens to be my favorite color. Nicely done! I love the fabric you chose! I have a couple plain, boring lamps laying around the house, and I've been wanting to freshen them up a little bit, so thanks for the inspiration! Love your lampshade makeover!!!! Thanks for linking up to my party at Jillify It! Thank you very much, Jill. The lampshade turned out great. I love that fabric! (I'm a 'frequent flyer' at JoAnn's, haha). Good job! Saw you at Debbiedoo's Newbie Party. Great job! Thank you for mentioning that you used my tutorial for the project. Love how beautiful your shade turned out! So cute! I love the fabric and the finished product! Thank you so much, Maury! Very pretty! I love the fabric you used. I'm your newest follower. Thank you so much! I love turquoise too. Thanks so much, Heather. We are excited that you are following us. That looks so good! I really love the fabric, it's so pretty! I love it! I especially love the color. That's such an easy fix. I was just looking at my lamp shades today thinking about how they need an upgrade! Thanks for linking up your projects at The Winthrop Chronicles. Thanks so much, Sarah. I can't wait to see what you do. Thanks for the invite to link up, Kristin. We appreciate you stopping by. Love, love your lampshade! You did an excellent job! Thank you so much, Maria Elena. This is great!! I definetly want to do these to some of my lamps that need some TLC :) I would be THRILLED to have you share this at my link party going on!! I am your newest follower through LINKY Followers...would love to have you follow back if you want! Thanks so much, Julie. Can't wait to see your project. I love the fabric on the shade. Great job. You made this look so easy! I might give this a try with a couple ugly lampshades that I have, haha! That looks fantastic! I would love for you to share this (and any other creations) at "Pin It and Win It Wednesday" @ www.cheapcraftymama.com! Thanks for sharing your tutorial! Your shade looks fabulous! I sooo need to do this to our living room lamp, yours looks fantastic. Our shade is all broken and a gross yellow color. Pinning for future reference, great tutorial! I love the fabric and this fabulous idea!!! Thank you for the inspiration. Newest follower!! Love the fabric you chose! Great makeover. Thanks so much for linking up to Terrific Tuesdays. I love the color of the fabric! This came out great. Thanks so much for sharing at Whimsy Wednesdays! It looks fabulous!! Love the fabric! Thank you so much for featuring this, Allison! We appreciate it so much. Enjoy your weekend. Thank you so much. I actually love that base too, but I was using it just for the photo. But, now I think I might just keep it that way. Thanks again. Great tutorial! I love the fabric you chose. I would love it if you would come link this up at my Pinworthy Projects Link Party. Thank you so much, Shannah. Anyway, awesome tutorial! Would love to try something like this someday. Sarah, Thanks so much for your comments. I love Joann's...that's a shame that yours closed. They have the same sales on their website if that helps you out. So beautiful! I love the colors!! I will have to try this sometime! Thank you so much, Onna. I LOVE the fabric. The lamp turned out really well - so cheery!! This is pretty easy to do and looks fabulous. Thanks for the tutorial. I'm pinning this. Thanks for linking up to Romance on a Dime!! Great tutorial. Great fabric. So great in fact that I pinned it! ... and where were you last month when I was digging around and googling for this very tutorial ...? You are an amazingly thrifty and talented decorator! Thanks so much for sharing your lamp shade tutorial at The Mother Lode linky party over at I Gotta Create! That turned out great. Thanks for sharing at the Sunday Round Up. can't wait to see what you share next week. Looks great! I am doing a Lamp redo blog shortly on by blog and was looking for a tutorial to cover the shade. I had an idea of how to do it... When I get it finished, I will post it and link your tutorial to the blog post! Thanks so much, Darlene. I'm excited to see your project. Great idea and upcycle!! I love the fabric you chose. Thanks so much for sharing with us at Link It UP Thursday. Thanks so much, Jami! I grabbed the button and linked up for this week. I love this! Using material to recover a lampshade is a great idea! I'll need to remember this. I will be featuring this tonight at my Swing into Spring party. It's such a great tutorial. The party opens at 8pm EST. Please stop by and pick up an I've Been Featured button. Thanks. Awesome lamp shade. The fabric is a definite wow! And you made it look easy. SUPER CUTE! I am totally loving this! I'm your newest follower! Ummm. That's it? That easy to make a GORGEOUS lampshade? Holy Lightbulb going off in my head! WOW I love this Megan!